Having a workspace that you love, one which lights you up and creatives feelings of positivity, is vital for a successful business. This means that the type of furniture that you have, decorations, feng shui and overall design and flow of the workspace, should not be taken lightly! Whether you have a leased office space or whether you work from home, don’t underestimate the power of your surroundings and how it can affect, your productivity, creativity and general wellbeing. When you think about it, the average person, spends at least 7 – 8 hours a day in their work space. More waking hours than we actually spend at home! Yet we spend more money on our surroundings at home, than we do our office. Fact is, our office is where we are most creative! It is where we produce our best work – especially for our businesses. So it’s extremely important that we have a work environment that we can connect with, one that nourishes our soul. 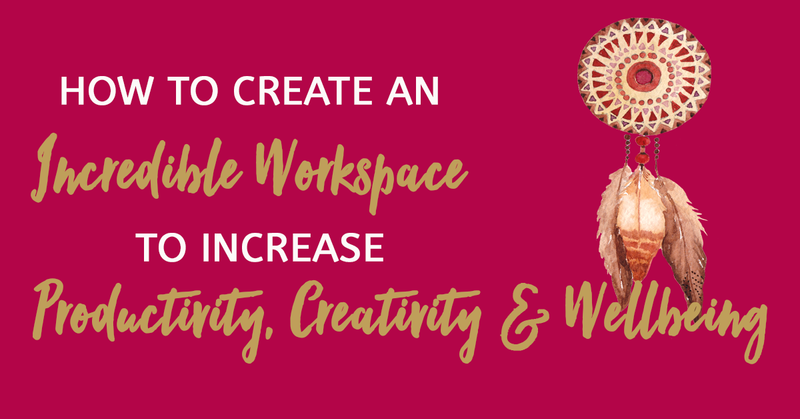 The top tips to maximise your workspace for success and abundance! P.S If this episode has helped you in anyway, please take some time today and review this on iTunes or Stitcher. Your review would really help to get this podcast out there – helping others, so a few minutes of your time will be greatly appreciated! Also, if you are a life coach, health coach or business coach who needs help designing and creating a coaching business that will one day give you a life of freedom, I am offering two coaching programs that can help you on your journey. The first coaching program is designed specifically for those of you who are just starting out. It’s called The Freedom Business Startup Coaching Package that can help you design and craft your freedom-based coaching business in just 4 weeks! In this package, you get a free consultation and 1:1 coaching/mentorship over 4 weeks. We will go through the Freedom Business roadmap and I’ll walk you through a step by step process to help you PLAN AND LAUNCH your freedom based coaching business! So if you’re a coach who’s either just finished your certification and ready to start your business, or perhaps a coach who wants to rebrand or remodel your business, so you can eventually have a business that offers you freedom, then contact me on email me at joveline@wildwomanrunfree.com to schedule your free discovery session with me. If this is not for you and you really want to get into the full project management of crafting, branding, launching and building your coaching business and want an intensive coaching program, I also offer the Freedom Business Intensive Coaching Package. This is for the serious business builders only. Those who need intensive guidance in the nitty gritty parts of the business, like how to create your website, how to market your business and how to get yourself out there, so you can be seen as a leader and make an impact in the world. If this is you, once again you can email me at joveline@wildwomanrunfree.com to schedule your free discovery session. Also, I am offering some coaches an opportunity to be interviewed on the Wild Woman Run Free podcast. It’s a great opportunity to brand your current business and an awesome way to support others too. Remember, the more you give, the more you attract. So if you want to be part of the future podcasts, let me know! And finally, if you want more free content, audios and videos about how to start a freedom based coaching business, you can either subscribe to the podcast or join the Wild Woman Run Free community on Facebook. I’ll send you updates on all the new freebies, which I’ll be releasing soon. Thanks again for joining me Wild Woman! I really appreciate having you here. It brings e so much joy to be helping you today. Until we meet again, have a wonderful week! Live Wild, Live Free, Wild Woman Run Free baby! Catch you later!